Fishing boats, pleasure craft and a ferry fill this busy port in rural Iceland. Here’s an example of an image that, to my mind, doesn’t make the cut. The photo shows some fishing boats and a larger ferry in a seaside town in northern Iceland. Most of that description is immediately evident in the photo. The rest (i.e., northern Iceland) you’d probably accept, particularly if you’re a regular visitor to this site. To my way of thinking this photo is what it is, but not a whole lot more. I just don’t think it goes beyond a straightforward documentary photo. It’s a record of being there, which is often the reason most folks make photos. However, to my mind, that just isn’t enough. I could have done better but the photo was made very much on the run, during a long day on the road. It wasn’t a day for photography, more a day of driving, and the clock was ticking. We’ve all had days like that when, no matter how important photography is to us, commitments, travelling companions and a lack of time compromise our ability to make great photos. Okay, I made an image that didn’t excite me. Yet, for some reason, I didn’t want to delete it. At least not yet. Sometimes the act of deletion or rejection is neither a quick nor a straightforward process. 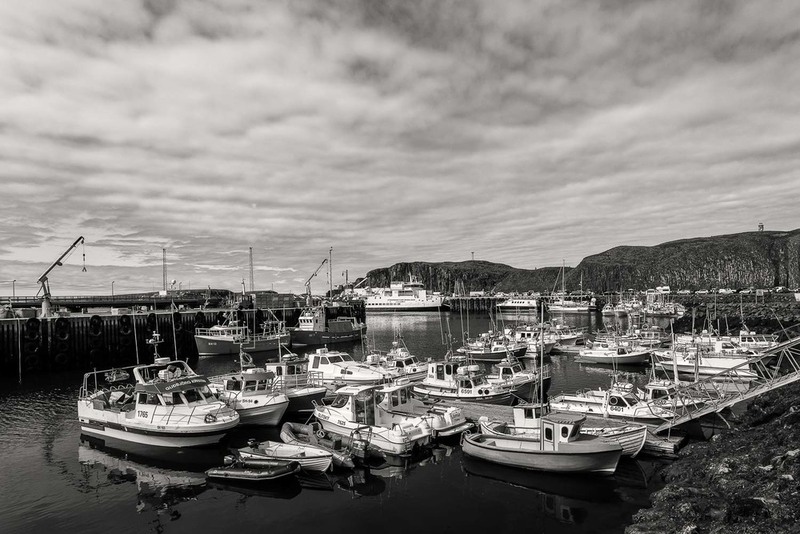 I converted the image from color to black and white which brings out the shapes of the boats and clouds. And I think that helped, but it wasn’t enough. The image is technically proficient being sharp, well exposed and with a full range of tones from black to near white. So, it’s a technically acceptable image, but no more than that. The image of the photo of the crowded jet boat is more exciting, and I think the warm and cool color contrast helps express the dynamic nature of this activity. Conversely the warm tone black and white photo of the old row boat, near the region centre of Mildura, in rural Australia has a very different mood evoking feelings of summer and the notion of day gone by. I’d suggest they’re both more successful photos than the one at the top of this post which, to my mind, fails to elicit a strong emotive response. An old row boat drifts aimlessly on placid waters on a warm, dreamy day near Mildura in Australia. I could consider cropping the image of the boats in the harbour at the top of this post into a panoramic format with the hope that, by eliminating most of the sky, a more dynamic composition might result. I think it would, but the problem is we’d be left with an overly complex image. The composition is a mess, with all those vertical lines, where it should be simplistic. And I believe a panoramic crop would only draw attention to those lines. Actually, this is the first reason why I normally wouldn’t publish this image: poor composition. Brightly colored canoes amidst the tranquil setting of the Swing Bridge and Swing Bridge Cafe on the Erskine River in Lorne, Australia. The second reason is that I don’t feel this image has any intrinsic artistic merit. While the value of such concepts have far less weight in our current contemporary world, I still believe that there are underlying concepts of beauty that unite subject matter, artist and viewers all over the world. Beauty may very well lie in the eyes of the beholder, but I still believe in universal concepts of beauty. It’s one of the things that unites us regardless of age, gender, race or religion. The soft gentle light and the simple structures of the bridge and the cafe, together with their reflections, in the photo of the canoes in front of the Swing Bridge Cafe in Lorne, on Australia’s Great Ocean Road, is a beautiful image. The reflections and the reduced number of objects in the frame make for a stronger, yet simpler composition. Which is exactly what people want to see. The remains of an old boat in the waters off Grytviken, South Georgia Island. My third reason for dismissing the photo from Iceland is that it lacks any strong communicative powers. It tells a story, and a pretty obvious one at that, but it fails to take us beyond the obvious: boats in a harbour. There’s no metaphor, no meaning to take us beyond the obvious story that’s being told. Compare that to this image of a heavily decayed old boat in the former whaling town of Grytviken on South Georgia Island in the Southern Atlantic Ocean. With the help of a basic caption it’s easy for folks to put together their own stories from this image. What’s more the notion of decay provides a potent metaphor, which can be associated with the life cycle of a variety of subjects from the natural and the constructed worlds. So, looking again at our Icelandic photo, we have a correctly exposed and well processed image that is deficient compositionally and lacks any artistic merit or communicative power. Is it difficult for me to talk about my own photography in this way? No, not at all. I’d rather celebrate and be remembered for my best images, rather than the failures. Needless to say I’m careful about the images I share. But we all make poor images, every now and again. Normally I delete them but, in this case, I felt there was a reason why I should hang onto it. I guess this post became that reason. A photo of Glenn Guy, the Travel Photography Guru, and travelling companions in front of, I think, the Tikse Gompa in Ladakh, India way back in 1988. Now, there is a case for holding onto less than great images, even if they lack artistic merit, great composition and even technical proficiency. They’re the images of people and places that hold special meaning for you, regardless of their quality. Perhaps it’s an image of your elderly mother, your child taking their very first steps or a picture of the tree under which you and your partner had your first kiss. Those images are precious and should be preserved. Take a look at the photo directly above of me and some backpacking buddies back in 1988 in front of the Tikse Gompa and village. The lighting is hard and unforgiving for people based photography. But, given that our faces are so small in the frame, it’s probably acceptable to most folks. The reason I’ve held onto the image for so long, and have finally published it, is that it’s one of the few surviving images from my first overseas adventure, a massive 3 ½ month journey to India, Nepal, China, Tibet and Thailand. Almost all of the images (i.e., 87%) from that trip were ruined by a camera malfunction and by mishaps in the processing of the slide films. Most were thrown out immediately. A few were scanned for posterity. Though those scans are very poor quality compared to what’s possible today. Adding Context To The Photos You Share Online? Whether you publish or share these images with others is your choice, as is where you publish them. And, if you do, providing a little context for why you’re doing so can remove the need photo enthusiasts might have to pick apart the photo. Those kind of comments just wouldn’t be relevant. But what you will receive is feedback from the heart which, ultimately, is the kind of feedback we most appreciate. What matters is that you protect those images, storing them in several places, even if they don’t meet your own high standards of excellence. After all, we only have one mother. In this case what matters to the heart is what matters most. Just don’t use that as an excuse for failing to delete all those other photos that have neither artistic nor personal value. That would be my advice. To become a better photographer I believe it’s important to surround yourself with your best images, not your worst. This ensures you learn from what you do well. As a result, you’ll make more good images, more often. After a while making good photos will become second nature. Though, needless to say, a little one-to-one private tuition will skyrocket you forwards. I also feel very strongly that, with the except of a few photos that possess a deeply personal connection, we should all limit the images we share with the world. I believe our worst images influence the way a collection of photos is remembered. So show less and be remembered for what you do well and what you’re proud of. The question is, now that this post is written, what am I going to do with the photo at the very top of this post?